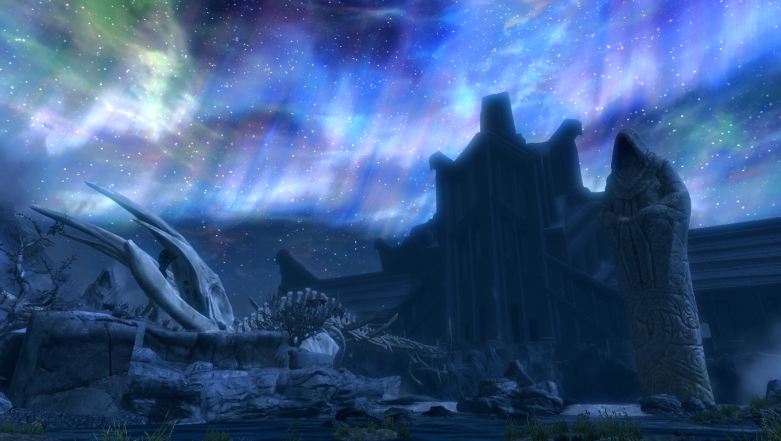 The Hall of Valor, inside the Nordic realm of the afterlife, Sovngarde. After formulating a plan to capture a dragon, Lydia and I returned to Dragon’s Reach. Standing on the giant porch of Dragon’s Reach, I let loose a shout that Paarthurnax taught me which summoned a dragon. After a minute or two a dragon flew in from the east and he began attacking us. After bringing him to the ground with Draongrend, we lured him in into the cacophonous porch of Dragon’s Reach and dropped a massive piece of lumber onto him. We made a deal that he would fly me to Alduin’s entrance to Sovngarde if I released him afterwards. Flying on the back of a dragon was incredible. Getting to see Skyrim from their perspective left me speechless as we glided in between the clouds. He flew me to the far east of Skyrim to an ancient ruin nestled in mountains. Before finding Alduin’s portal, I had to face down Draugr and dragons and a strong dragon priest. I breached the portal and was whisked off the Nordic afterlife of Sovngarde. It was a fascinating place, filled with the towering mountains of Skyrim but with more trees and flowers and hot springs. But also, more mist. I met a Nord looking for the Hall of Valor, but he complained of this mist. I used Clear Skies and made myself a visible path, eventually making it to the Hall of Valor. It was a giant building separated from the rest of Sovngarde by a bridge constructed of the remains of a dragon, also a large brute named Tsun. He wouldn’t let me enter unless I could defeat him in a traditional battle. I did and he allowed me to pass. Inside the Hall of Valor I met Hakon, Gormlaith, and Felldir, the legendary heroes who battled Alduin in the past. They were ready to face down Alduin again and get it right this time,especially since he was feeding on the lost souls inside Sovngarde. We left the Hall of Valor and began clearing the mist. Alduin kept bringing it back. We continued this trend a few times before Alduin sought us out. I hit him with Dragonrend and plummeted to the ground; the legendary heroes and I wailed on Alduin until he took to the sky again. He called down flaming rocks from the sky and we dodged them as best we could and healed when we couldn’t. I kept hitting Alduin with Dragonrend grounding him and we dealt damage to him as best we could. We prevailed and destroyed Alduin for good. We watched as he died and his body disintegrated before our very eyes. The heroes were pleased beyond belief and we celebrated before I was transported back to Skyrim.